I rescued the baby's breath from my Valentine's roses and stuck it in a coffee container that long ago lost its cover to my clumsiness. These birds are from a punch I purchased at Hobby Lobby. It was under $10 with a coupon and I'm having a great time with it. I used some heavy scrapbook paper I had and they coordinate with the "Gather" pendant. The wood for this sign is actually a vintage card table that I got at a yard sale for about $5. A stencil and some leftover paint made for this imperfect sign that I love! I found these small hurricane style candle holders at Hobby Lobby for $1 each. They only had 3 but I found the same ones at Walmart for the same price. I use them for every season by simply filling them with different materials and adding tea lights. Right now they actually have some kind of grain as filler. It was expired and I was going to toss it anyway. I made the "GATHER" pendant with the scrapbook paper I had. I cut out the triangles and punched holes in the top for the jute string. The burlap letters are from Walmart and cost about $3. I punched some more birds and that was it. I purchased this beautiful white flower arrangement with a gift card I had for TJ Maxx. This one was only $10. The similar arrangement on the table was a little more, but I LOVE them! I'm not sure about the fake greenery. Should it stay or should it go? 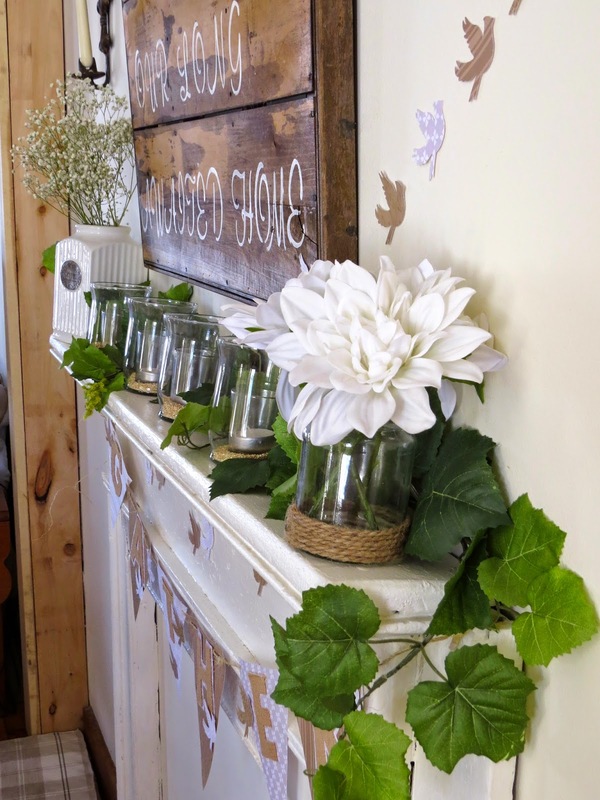 Your early spring mantel looks great! Thanx for sharing at THT. 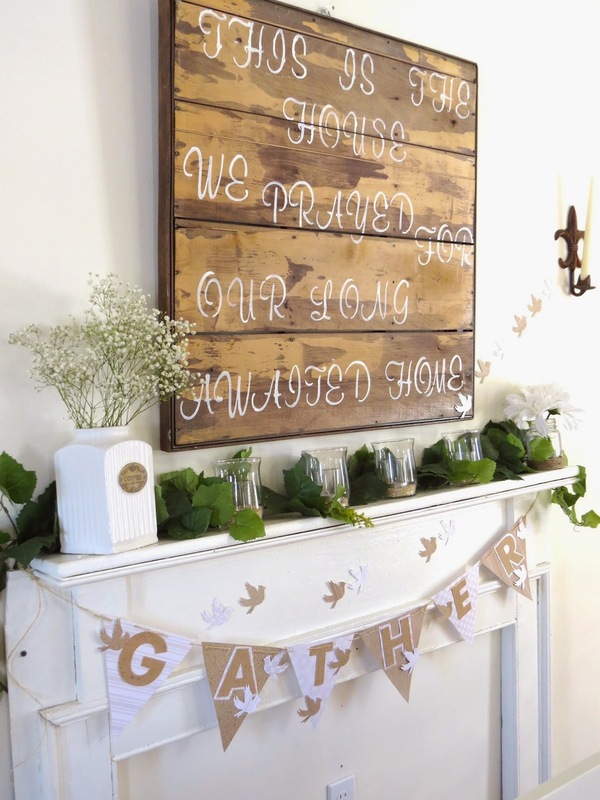 I just love the sign above the mantel! Green and white is so classy and welcoming. Have a wonderful weekend! Very nice mantel! Pinned! Thanks for joining HSH! I love how you decorated this! It's really nice and gives a fresh look to begin this season of spring! It is a fresh spring scene with or without the greenery. I like your homemade Gather bunting and the bird shapes. How neat that you made a sign from an old card table.